REDSTONE ARSENAL, Ala.--According to tradition the gift for a 10th anniversary is tin or aluminum but diamond jewelry is the modern taste. Whatever the taste, get your gifts ready. 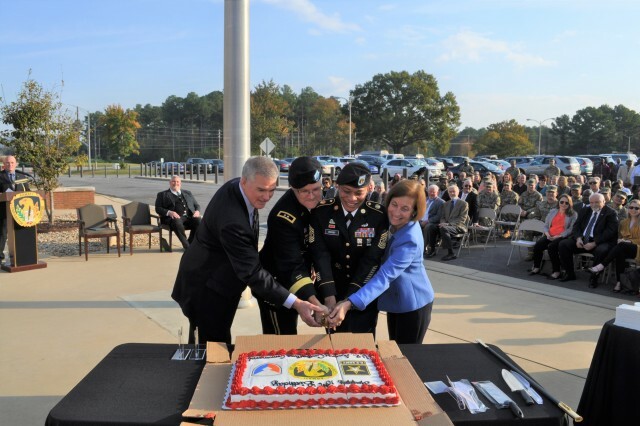 Army Contracting Command is 10 years old. ACC celebrated its tenth anniversary in a ceremony at its headquarters here Oct. 31. Jeff Parsons, ACC's first executive director, told the crowd of about 200 Soldiers, civilians and invited guests how the command was formed to address an urgent Army need. "We set this command on a course back in 2008," he said. "I'm glad to see the command is still operating. I think the Army does see the value of the command in providing the essential contracting support to our Soldiers and I hope this continues into the future." Parsons said another important aspect of the command is its role in developing the contracting workforce. "I think it's just as important that we stay the course in training and equipping our contracting and procurement workforce as we go forward," he said. He said the Army "suffered dearly" in the early stages of Operation Iraqi Freedom and Operation Enduring Freedom because of the lack of "deployable, experienced professionals" in the contracting workforce. "Guys poke fun at me with my Air Force background," said Parsons, who is a retired Air Force colonel," but I think most people would acknowledge if it hadn't been for the Air Force and their contracting professionals in the military, the Army would have suffered dearly in the early parts of the war." Parsons said hiring decisions in the 1990s produced a workforce that lacked knowledge and experience in handling complex contracts. When he left ACC, Parsons was asked what his biggest concern was. "Sometimes we forget the lessons learned from the past," he responded. "We don't embrace what we learn on staff rides. And then what happens? History repeats itself and we seem to re-learn what we should have known in the first place. "The message here is to stay the course with what we've built with Army Contracting Command," he continued. "Remain prepared for the next conflict we face because unless the draft is reinstated in this country, you will need contractors to support our Soldiers and you need to be prepared to manage them effectively." Maj. Gen. Paul Pardew, ACC commander, began his remarks by recognizing the ACC "plank-holders" those who along with Parsons stood up the command at its original headquarters at Fort Belvoir, Virginia. About 30 plank-holders, many of them still serving in ACC, rose to applause from the rest of the audience. ACC relocated to Redstone Arsenal in 2011. Pardew told the audience ACC's mission is "indispensable to the Army." "The Army doesn't recruit, train, deploy troops or go to war without contracting support," he said. "As you've heard General Gus Perna (Army Materiel Command commander) say many times, the Army has two missions: preparing for combat and engaging in combat. Our Soldiers and civilians make that possible. General Perna says that without Army contracting, the Army comes to a halt. Let that sink in." Pardew highlighted contracting accomplishments from across the command as well as ACC's support to Army Futures Command. "ACC is fully engaged in making Futures Command successful," he said. We have senior contracting officers embedded with every one of the cross-functional teams. We're also creating a contracting cell within Futures Command headquarters." He emphasized the command's pivot to contract administration while maintaining its focus on execution of current year dollars. "We're good," he said, "but we can and need to be better. We are in the midst of a pivot across Army Contracting Command. Part of this pivot is changing the way we do business--a culture change that begins with us and will slowly but surely change the culture across the Army acquisition workforce. We are going on the offensive. "Our top priority remains the execution of current year funds to support readiness and modernization," he added. "That's what we do day-in and day-out supporting Army readiness. But we've got to break the paradigm of waiting for work to come to us." He said contracting officers need to be engaged with their requiring activities early on and drive the contracting process. "We all know when contracts are due to expire," said. "We need to be banging on the door of the requiring activities asking if the requirement is still valid. If so, then we need to be in lock step with the requiring activity, ensuring they develop an actionable requirements package that we can put on the street and deliver the goods or services on time." Pardew also looked to the future. "Today's ACC isn't the ACC of 10 years ago," he continued. "Neither will the ACC of 10 years from now look like today's ACC. We are constantly adapting to change. That's why it's important for us to be a learning organization. We'll have new tools, organizations, processes and procedures, but we'll still need the innovative thinking, creativity and institutional knowledge that our people bring to the fight to be able to adapt to the constantly changing environment." He closed by emphasizing the command's importance in delivering goods and services to the Soldier in the field. "That's our real mission," Pardew said. "You've done it extremely well over the last 10 years. As you've heard from Mr. (Mike) Weitzel and Mr. Parsons, we've built and matured this organization 'as the plane was flying.' Let's take that foundation and write even more amazing Army Contracting history, ensuring our Army has what it needs every day." Weitzel, ACC command historian, kicked off the ceremony by recounting Army contracting history. He said Army contracting is the second-oldest mission in the Army. "On 14 June 1775 the Continental Congress authorized the adoption of the Colonist troops around Boston as the Continental Army," Weitzel explained. "That same day they voted $2,000 to support the forces around Boston. While we celebrate Army Contracting Command's birthday today, our mission is the second oldest in the Army, by a couple of hours." He recounted Army contracting history from the Revolutionary War to today. He pointed out how contracting support--good and bad--affected the result on the battlefield in wars and campaigns stateside and abroad. Our history is young still," he added. "Ten years. But our mission is as old as the Army itself. We are the difference between victory and defeat." The ceremony closed with Pardew, Parsons, ACC Command Sgt. Major Jill Crosby and retired Maj. Gen. Camille Nichols, ACC's first commander, cutting the anniversary cake.